Scientists at UC Berkeley have taken brain scans of subjects in an fMRI machine while they watched a movie clip. They then reconstructed the movie the subjects were watching using only the brain scan data, and a database of 18 million seconds of random video gleaned from the web. First, they used fMRI imaging to measure brain activity in visual cortex as a person looked at several hours of movies. They then used those data to develop computational models that could predict the pattern of brain activity that would be elicited by any arbitrary movies (i.e., movies that were not in the initial set). Next, they used fMRI to measure brain activity elicited by a second set of movies that were also distinct from the first set. 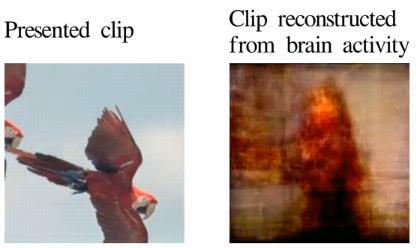 Finally, they used the computational models to process the elicited brain activity, and reconstruct the movies in the second set. The amount of new understanding this could allow us to gather about mind-brain correlates and first person knowledge should be considerable. If this lives up to the hype, a lot of new research ideas should come out of it. Keeping fingers crossed here. Here's another clip, which contains a nice overview of the experiment results.